Triple Chocolate Mess recipe by Nazia Nazar at PakiRecipes.com. 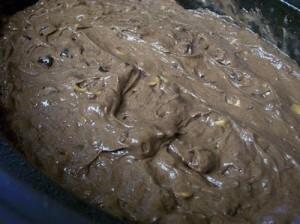 In a large bowl stir together the cake mix and the pudding mix. In a medium bowl, beat the eggs with the water, then add the sour cream and Soya Supreme Cooking Oil and stir until smooth. Add the liquid to the dry ingredients and beat well. Stir in the chocolate chips. Spray the inside of the crockpot with Soya Supreme Cooking Oil. Pour batter into crockpot. Place a paper towel over the top of the crockpot and then cover and cook on low for 6 hours. The paper towel absorbs the moisture and keeps it from dripping back into the pot. Change it once or twice if it gets really wet. Serve the dessert warm in a bowl with ice cream or whipped cream.